This month is all about chocolate. Rich, luscious chocolate. I love the stuff. I would swim in it if it was socially acceptable. I would eat if for breakfast, lunch and dinner if I could. Any excuse to bake with chocolate is a great day in my world. Today is a fabulous day. 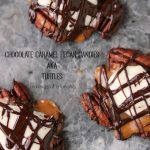 I was able to bake with chocolate and turn it into a turtle treat. For those who know me well, you know how much I adore all things turtle. If I can find a way to make any dish a turtle dish I’m going to try. Honestly turtles make my heart go pitter patter. The only thing that compares in my world to turtles is pizza. One of my dear friends, Izzy of Crumb knows my extreme love of chocolate, turtles and pizza so when she guest posted for me in the summer she combined all those things into a Turtle Pizza. Can you say “heaven on a plate”. 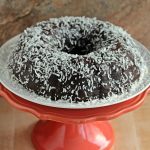 When the theme for February’s Bundt was announced I think I pounced like a cougar (not THAT kind) and wrote “Turtle Bundt” on the list about .345 seconds after it was posted. I’m sure some folks are rolling their eyes and saying “oh that Lunie, she’s so predictable”. But I really don’t give a good gosh dang to be bluntly honest. I’m sitting here typing with a mouth full of turtle bundt cake while you’re eating a boring salad so I think I can deal. I think I got the “not so short end of the stick” on that deal. Honestly if I could marry this cake I would. I think hubs might take an exception to that though. It’s okay hubs, I love ya, but man it’s turtle freaking bundt cake for crying out loud. Cut me some slack here. If you are craving chocolate this is your cake. If you dig turtles this is your cake. If you love pecans this is your cake. If you are a caramel junkie this is your cake. I dig all those things so this is my cake. You go make your own man! Mitts off mine! 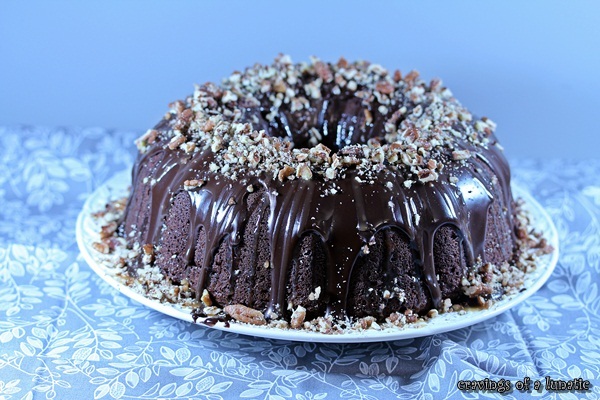 A delicious Turtle Bundt Cake loaded with pecans, chocolate and caramel. Spray a bundt pan generously with non stick spray. Combine flour, cocoa, baking soda and salt in a medium sized bowl. Whisk. Set aside. Combine milk and yogurt in a separate medium sized bowl. Whisk. Set aside. In a stand mixer cream the sugars and butter together till very light and fluffy. Begin to beat in eggs, one at a time until well incorporated. Turn mixer down to low and add the flour mixture you set aside earlier, and alternate with the milk mixture you also set aside. Do it in about three additions and end with the flour mixture. Now add the pecans and mix by hand. Pour the mixture into the bundt pan and smooth out. Place in your preheated oven for about 55 to 60 minutes. Heat up your milk in a small saucepan on the stove until it's warm. Pour the warm milk over the chocolate. Allow to sit for about 2 to 3 minutes. Allow to cool and thicken a bit before pouring over the cake. In a medium saucepan combine the sugar and water. Give it a good stir. Let it cook over medium low heat until sugar dissolves. Now stop stirring and let it continue to cook. It will start to turn amber in colour after some time so watch it closely but do not stir. You can pop the lid on to keep crystals from forming on the pot at this point. Once it turns amber, remove from heat. Pour in the cream. It will bubble up, this is suppose to happen so do not panic. Give it a stir. Now add the butter. It will bubble up a bit again, don't panic. Whisk until smooth. Add vanilla and salt. Whisk until smooth. Allow to cool before pouring on cake. Once the cake is cooled and the chocolate is cooled you can pour the chocolate glaze over top of the cake. Pop the cake in the fridge for a bit to let the chocolate firm up. Once the chocolate if firm and the caramel is cool, pour or drizzle that over top of the cake. Toss your pecans over top. If you would like to learn how to make your own Vanilla Salt or Vanilla Sugar it’s super easy to do. Just click the links and I’ll show you just how easy it is. If you have no inclination to make it and you’re thinking to yourself, cripes Lunie I have better things to do with my time than make weird stuff, that’s fine. Just use regular sugar and salt. It’s okay with me if you’re super de duper boring. My only disappointment with the cake is purely based on photos. You cannot see the caramel drizzled all over it in the photos. I may see if I can get a shot in natural light and maybe it will show up better. There’s tons of caramel on it but you can’t seem to see it. I’ll try to fix that with some tinkering. Link to BundtaMonth on Facebook! 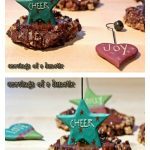 Link to BundtaMonth on Pinterest! Thank you to Anurahda of Baker Street and Lora of Cake Duchess for hosting our Bundt Party every month. You ladies rock. Lora we miss you and hope you are doing okay. Much love lady! While I have your chocolatey attention I would like to let you know Kristen of Frugal Antics of a Harried Homemaker is hosting a Solid Month of Chocolate. If you do not know Kristen it’s time to change that. I love the woman and she bakes some delicious stuff. Today’s chocolate treat is Paleo Chocolate Cheesecake. You must go check it out. She’s got lots of folks guesting for her this month too, including “moi” on Valentine’s Day. A month of chocolate, I’m totally down with that idea. Kristen is an evil genius! I think I could do a Meg Ryan and start screaming “Yes,yes,yes” to a cake like that. You are the Duchess of Turtle. Could that be Canadian royalty? This sounds totally decadent! I must have it. Wait a second….. a WHOLE MONTH dedicated to chocolate???? So February is now my favourite month of the year…. I have to talk to the guys at Nutella and Baci right away!!! You are my turtle hero! I’ve been waiting on the recipe since you posted “Turtle Cake” .345 seconds after the event was announced. OMG! 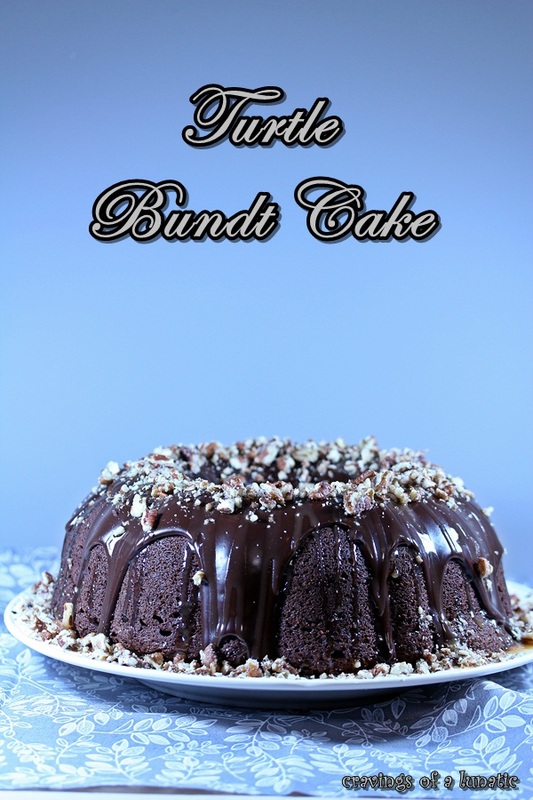 This bundt cake looks amazing! I am seeing bundt cakes all over the place today and now I have the need to make one!!! I can only imagine how wonderful your cake must taste!! Yes, one very large slice for me, please! Scrumptious! 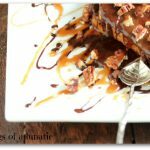 I love chocolate and caramel and I so have to make this! Chocolatey goodness, come to mama! Chocolate and caramel, they need no words. 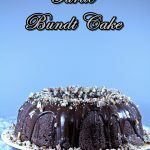 Absolutely fantastic bundt! What, 15 comments and no one has made a “I like big bundts and I cannot lie” joke? Wow– I want a piece of this cake! 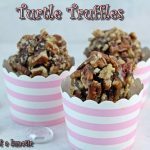 I love all things turtle and can’t wait to look through some of your other turtle recipes. This is fantastic! This might be the most perfect chocolate bundt cake ever created. i can’t even talk about this right now WHY DID I PICK TODAY TO START A DIET. I love your enthusiasm for turtles, Kim! As well as the luscious looking Turtle Bundt. Sincerely I thank you too for your enthusiasm and step by step recipes…I’ve always been a bit intimidated by caramel but I think with your instructions in hand I can give it a go! OHMAHGAW I want to dive face first into this incredible bundt. If I couldn’t eat chocolate, I wouldn’t want to live – for real. This looks so dark, decadent, and rich – exactly what a perfect chocolate cake should be. I’m glad you went with your instincts and made this beauty. I love this!! I love chocolate turtles too. . I mean, who doesn’t? Chocolate, caramel and pecans? what’s not to love? Dude, this is awesome. Brilliant! You won’t hear me complain about a turtle dessert… unless it’s made from the sort that walks around with 4 legs and has a hard shell, of course. Your cake looks amazing! Caramel, chocolate, pecans… yes please!! This cake is gorgeous and sounds like pure decadence. Love it! Love it! 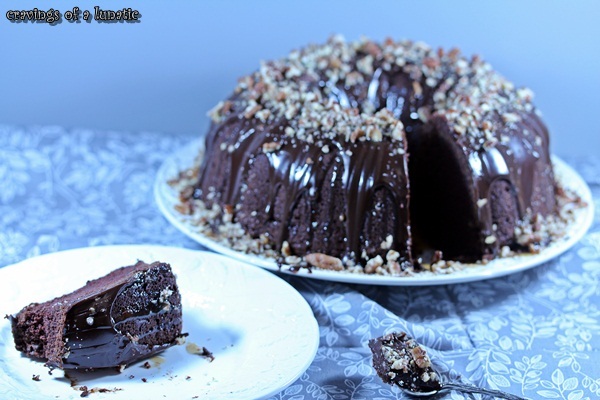 My favorite turtle anything is cheesecake, but I’l tkae it in a chocolate bundt cake! I have to admit you inspired my bundt this week because you got me thinking of nuts. I so love chocolate, nuts and caramel. Nothing better!! It’s not socially acceptable to swim in chocolate? Now you tell me! 😉 Great looking cake. 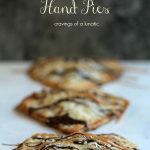 Pretty pictures, and nice recipe. You can make me a turtle anything anytime. Good stuff – thanks. This is so intense! I love all of your Turtle desserts! After looking the recipe over (And putting the cake in the oven…) I noticed I totally forgot to add both the vanilla and rum extract, I was able to salvage everything by yanking the cake out of the oven and adding them, but am I just blind and missing the step or is it really not there? It smells delicious, tonight really isn’t my night though! After getting the cake BACK in the oven, I totally forgot to turn it back on, so it “baked” for a good 45 minutes in a warm oven (lol!!). I actually prefer the denser cakes to their lighter counterparts but this was my first time ever attempting to bake one. If it tastes as good as it smell, it will be perfection! Oh dear, I’ve done that. A friend of mine once left meat in her warming drawer during a party. Then zipped off out of town for like a week and forgot about it. Imagine her surprise when she returned home. Yikes. I’ve also forgotten to turn my slow cooker on and had it sit there for hours before I realized. So you are not alone. Lol! The Bundt Group is going strong, I just do not post with them any more. But if you visit the other links in the post most of those gals post bundts every month. So there’s lots of inspiration to be had. Hope it tastes good. I’m a turtle fiend and feel compelled to turtle every recipe at some point.